Every few months we're going to be getting to know one of our service centre managers a bit better with a Q&A session. Manager at our Mornington Service Centre. It would have to be a Sunday Roast. You can’t beat roast beef and Yorkshire pudding. Nottingham Forest….oh you mean AFL…well Hawthorn then. Since I was 16…so that’s 19 years now. I’ve been with Cooper Automotive for 2 and a half years. I arrived from England on a Sunday, started work on the Monday. It’s the customer satisfaction which makes for job satisfaction. Really making things easy for people and doing a good job so they leave happy. And next time they come in they know your name. It’s rewarding. Customer service. It makes all the difference. People love our local pick up and delivery service. Having your car serviced doesn’t need to cause any inconvenience at all. 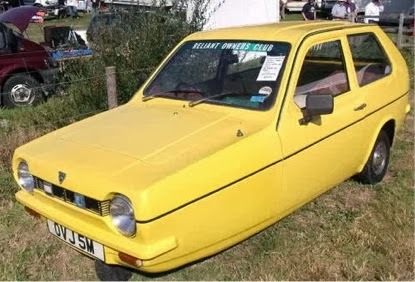 A classic English car - the Robin Reliant! Most interesting car ever worked on? That would be a robin reliant. It was a quirky 3-wheeler. I don’t think you had them in Australia. I’d love a McLaren Formula 1 car. I saw one in Melbourne…it was amazing. Aaarrrgh…where do I start. It’s the lack of manners on the road. People don’t let you in to merge lanes, and when you let someone in they don’t wave to say thank you. And people that drive in the right hand lane all the time…don’t we drive on the left here!? I think looking after tyres and brakes are the most important things. And regular all-round servicing of course! Ben and colleague Andrew, front-of-house at the Mornington Service Centre.